Scott Ramsay has retired after a successful career in football. One of the locality’s top footballers of the last two decades has called time on a successful career. Scott Ramsay made his final appearance last weekend as part of a Westfield side which lost 2-0 at home to Macron Store Southern Combination League Division Two champions Rustington. 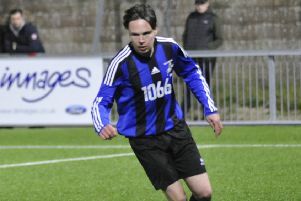 Scott Ramsay in action for Westfield last year. Westfield joint manager Jack Stapley said: “He’s obviously been a fantastic player throughout his career. He’s dedicated his life to football really from being a professional at a young age. “He’s still a good player and I think he could still carry on, but I think his body is telling him no. Now 37, Ramsay started his career with Brighton & Hove just before the turn of the century and made 35 appearances for the Seagulls, scoring twice. He had a loan spell with Yeovil Town and spent five months at Dover Athletic in 2002 before joining Eastbourne Borough, for whom he scored 135 goals in 283 appearances. Ramsay was part of the Borough team which reached the FA Cup first round for the first time in the club’s history in 2006 and which won promotion into the National League. He signed for Hastings United in 2008 and made more than 70 appearances in two years before moving to Rye United, who he helped reach the FA Vase quarter-finals in 2011. In recent times Ramsay has played for Westfield and Macron East Sussex Football League club Ore Athletic, and spent most of the latter part of his career as a defender.